How Much Is My Kennedy Half Dollar Worth? The United States Mint first produced the Kennedy half dollars in 1964 a few months after the assassination of President John F. Kennedy in Dallas, Texas. The nation was in mourning after the assassination of this popular president. Congress moved quickly to pass a law (Public Law 88-256) to eliminate the Franklin half dollar design and create a coin to commemorate President John F. Kennedy. Gilroy Roberts created the portrait of Kennedy on the obverse and Frank Gasparro sculpted the heraldic eagle on the reverse based upon the Great Seal of the United States. In 1964 Kennedy half dollars were made from 90% silver and 10% copper. Half dollars made from 1965 through 1970 are composed of two outer layers containing 80% silver and 20% copper with an inner core of 20.9% silver and 79.1% copper (net composition: 40% silver and 60% copper). Coins minted in 1971 and beyond have outer layers composed of 75% copper and 25% nickel bonded to an inner core of pure copper. The coin has a diameter of 30.6 mm and a reeded edge. You can still obtain Kennedy half dollars from some banks for face value and are quite common. Circulated coins minted from 1964 to 1970 derive most of their value from their silver content. From 1965 to 1970 the silver content was reduced from 90% (in 1964 dated coins) to 40% silver. 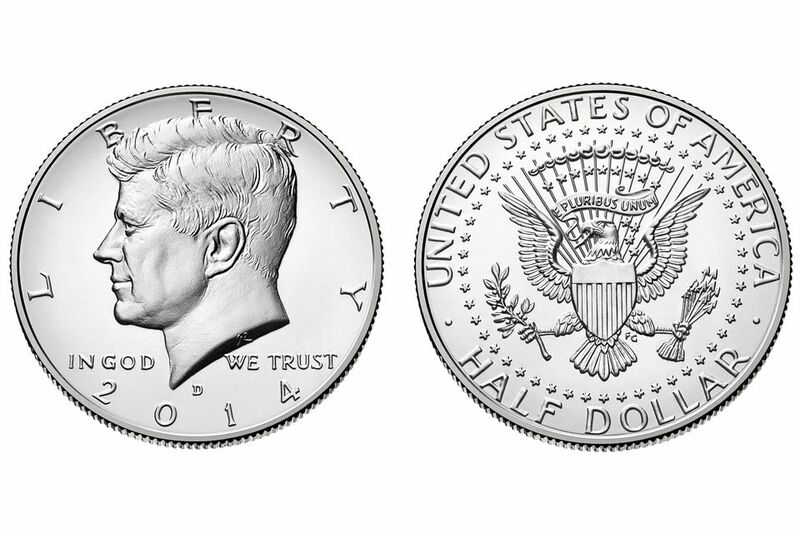 The popularity of collecting Kennedy half dollars is beginning to increase. While there are some Kennedy half minor varieties, there are no issues that are exceedingly rare or expensive. The mint made special collector coins from 1965 to 1967, and again beginning in 1992. These coins are quite affordable for any coin collecting budget. In 1975 and 1976 the coins displayed a date of 1776-1976. These coins are circulating commemorative coins to celebrate Bicentennial of the United States. Although they appear unique, billions of these coins were minted and carry no premium value. However, in 1970 the United States Mint made Kennedy half dollars at both the Denver mint facility and the San Francisco mint facility. The Philadelphia mint did not produce any half dollars in 1970. The mint produced coins in San Francisco with a Proof finish for inclusion the 1970 Proof set. The coins minted in Denver were business strike quality and included in United States Uncirculated Mint Sets. Therefore, the only way to obtain an example of a circulation quality 1970-D Kennedy half-dollar is to buy the United States Uncirculated 1970 Mint Set. If your coin is worn and looks similar to the one illustrated in the link below, it is considered a circulated coin. If your coin looks similar to the one illustrated in the link below and has no evidence of wear due to being in circulation, it is considered an uncirculated coin. The mint produced Kennedy half dollars at three different mints: Philadelphia (no mint mark or P), Denver (D) and San Francisco (S). As illustrated in the pictures in the links below, the mint mark is located on the reverse of the 1964 coin located on the left-hand side just below the eagle's claw. From 1968 until today, the mint mark is located on the obverse of the coin just below the point of Kennedy's bust and above the date. From 1965 to 1967 all U.S. coins did not carry a mint mark. The buy price is what you can expect to purchase the coin and sell value is what you can expect from a dealer when you sell the coin. Average circulated and average uncirculated values are given. These are approximate retail prices and wholesale values. The actual offer you receive from a particular coin dealer will vary depending on the actual grade of the coin and some other factors that determine its worth. 1995 $1.00 F.V. $2.00 F.V. 1995-D $1.00 F.V. $2.00 F.V. 1996 $1.00 F.V. $2.00 F.V. 1996-D $1.00 F.V. $2.00 F.V. 1998 $1.00 F.V. $1.00 F.V. 1998-D $1.00 F.V. $1.20 F.V. 1999 $1.00 F.V. $1.20 F.V. 1999-D $1.00 F.V. $1.00 F.V. 2000 $1.00 F.V. $1.00 F.V. 2000-D $1.00 F.V. $1.00 F.V. 2001-D $1.00 F.V. $1.00 F.V. 2003 $1.00 F.V. $1.10 F.V. 2003-D $1.00 F.V. $1.10 F.V. 2004 $1.00 F.V. $1.00 F.V. 2004-D $1.00 F.V. $1.00 F.V. 2005 $1.00 F.V. $1.00 F.V. 2005-D $1.00 F.V. $1.00 F.V. 2006 $1.00 F.V. $1.00 F.V. 2006-D $1.00 F.V. $1.00 F.V. 2007 $1.00 F.V. $1.00 F.V. 2007-D $1.00 F.V. $1.00 F.V. 2008 $1.00 F.V. $1.00 F.V. 2008-D $1.00 F.V. $1.00 F.V. 2009 $1.00 F.V. $1.00 F.V. 2009-D $1.00 F.V. $1.00 F.V. 2010 $1.00 F.V. $1.00 F.V. 2010-D $1.00 F.V. $1.00 F.V. 2011-P $1.00 F.V. $1.00 F.V. 2011-D $1.00 F.V. $1.00 F.V. 2012-P $1.00 F.V. $1.00 F.V. 2012-D $1.00 F.V. $1.00 F.V. 2013-P $1.00 F.V. $1.00 F.V. 2013-D $1.00 F.V. $1.00 F.V. 2014-P $1.00 F.V. $1.00 F.V. 2014-D $1.00 F.V. $1.00 F.V. 2015-P $1.00 F.V. $1.00 F.V. 2015-D $1.00 F.V. $1.00 F.V. * = See the section above "Key Dates, Rarities and Varieties" for more information on these coins. The values in this chart were assembled from my personal analysis of the coin market. How Much Is My Roosevelt Clad Dime (1965-Date) Worth? How Much Is My Barber Half Dollar Worth? How Much Is My Jefferson Nickel Worth? How Much Is My Franklin Half Dollar (1948-1963) Worth? How Much Is My Walking Liberty Half Dollar Worth? What Is the Value of a Buffalo (Indian Head) Nickel? How Much Is My Lincoln Memorial Penny Worth?